The patented, award winning design of the GearWrench XL X-Beam combination ratcheting wrench has over 500% more surface area, enabling more force and less hand fatigue. The GearWrench XL X-Beam combination ratcheting wrench features a one piece forged beam design with no metal twisting or weak spots. The GearWrench XL X-Beam combination ratcheting wrench is up to 25% longer to access hard-to-reach fasteners and has a Surface Drive on the box end that provides off-corner loading for better grip and reduced fastener rounding. The 85288 GearWrench 12 Point Metric XL X-Beam Flex Combination Ratcheting Wrench 12 Piece Set is one of thousands of quality tooling products available from MRO Tools. Please browse GearWrench 12 Point XL X-Beam Combination Ratcheting Wrench Sets for tools similar to the 85288 GearWrench 12 Point Metric XL X-Beam Flex Combination Ratcheting Wrench 12 Piece Set. 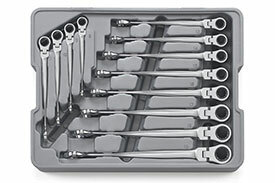 85288 GearWrench 12 Point Metric XL X-Beam Flex Combination Ratcheting Wrench 12 Piece Set description summary: GearWrench 12 point metric XL X-Beam flex combination ratcheting wrench 12 piece set. 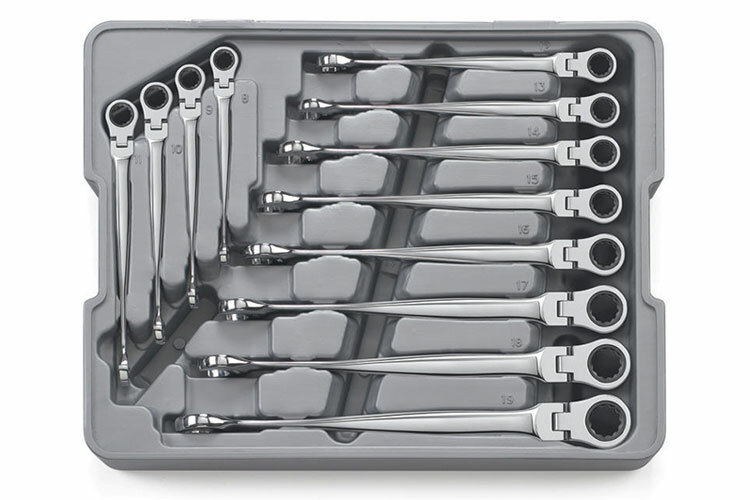 Number of Pieces: 12 Piece Opening: Metric Point Size: 12 Point Quantity discounts may be available for the 85288 GearWrench 12 Point Metric XL X-Beam Flex Combination Ratcheting Wrench 12 Piece Set. Please contact MRO Tools for details.